Tech Guy and I marked our twentieth wedding anniversary this week. His niece, who was our flower girl all those years ago, is being married in August and her mom circulated engagement photos to the extended family last weekend. Looking at those engagement pictures and then revisiting my own wedding photos was a poignant reminder of all the living that comes after the happy-ever-after I write about. 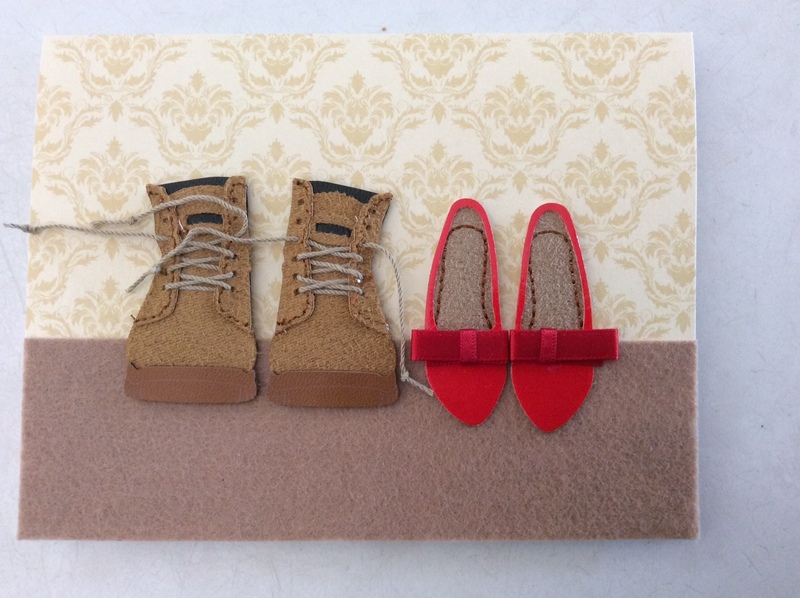 And, as depicted by the footwear on the card Tech Guy gave me for this anniversary, how we’ve complemented each other while also celebrating our differences. Much like the course of married life, our wedding wasn’t perfect. My matron-of-honour’s dress required emergency alterations less than forty-eight hours before the ceremony. I spent the evening of our rehearsal dinner wearing Tech Guy’s jacket when the zipper fell out of the party dress I’d bought especially for the occasion. Our wedding cake got squashed on its journey from the bakery to the reception site and had to be strategically placed on a sideboard to hide the damage. The cake’s frosting also bore no relation to the tints we’d chosen to match our wedding colours. Owing to a herniated disc in my back, I was strapped in surgical tape beneath my wedding dress and had to stay rigidly upright during the ceremony and reception. During those parts of the ceremony where kneeling was required, Tech Guy hauled me to my feet in a chivalrous, but less than romantic gesture. Yet, in the most important ways, our wedding was perfect. It was the expression on Tech Guy’s face as we exchanged our vows, and the tell-tale crack of emotion in his voice. It was the silence in the little country chapel where generations of my family had worshipped. A silence broken only by the rustle of the breeze through the open windows and faint chirp of birdsong. It was the pledge we made to each other. Whatever the future held we’d face it together. Two decades ago, I’m glad I didn’t know what that future would bring. Along with joys, there have also been sorrows and tragedies aplenty. However, although the vows we made have been stretched and tested, I wouldn’t have wanted to face those years without Tech Guy by my side. We were apart for our anniversary this week, and I can’t pretend it wasn’t hard. Owing to English Rose’s medical situation, we can’t attend his niece’s wedding either. But like dresses and cakes and sore backs, these are small blips in life and on the radar of a marriage. Day by day, we’ve worked on our happy-ever-after for the past twenty years, and I hope we’re granted another twenty and more. Looking at Tech Guy’s niece and her fiancé smiling in their engagement photos, my hope is that they too will grow and learn together no matter what life throws at them. As for the cake? Blip or not, I’d like English Rose, already a baker extraordinaire, to make a cake for our twenty-fifth anniversary. To be on the safe side, though, I’m sticking to a white and silver theme with no transport involved! Since Tech Guy is a bit shy (i.e. he values his privacy! ), I’m not including a wedding photo with this post. 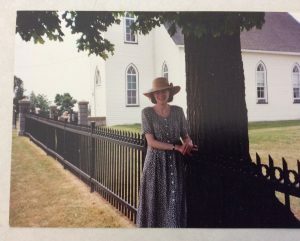 Instead, this photo is one he took of me in 1995 when we were newly engaged and planning our wedding later held in this rural Ontario chapel. Wonderful memories and wise thoughts. I don’t think you’ve changed a bit since 1995! Thank you, Jean. You’re so kind! I was wearing a hat in that picture, though, so I think the changes are hidden! What a wonderful, heartfelt post, Jen. Just perfect. Thank you for sharing your special memories. Many congratulations to you and Tech Guy on your anniversary. Thanks so much, Sue. I’m glad you enjoyed the post. #weddingday memories shared by writer @JenGilroy1 in this lovely, thoughtful blog https://t.co/aWZhZO9kjv Happy anniversary, Jen & Tech Guy! I loved the fact that you mentioned working hard at the “happy-ever-after”. Like any relationship, marriage requires constant care and maintenance, but the fruits of that labour can be a beautiful thing! Happy anniversary…. Thank you, Heidi. I think marriage is a lot like a garden. It needs constant weeding and care so is always a work in progress!